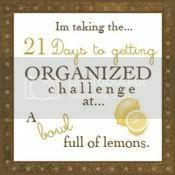 No you didn't miss any posts~ I skipped two challenges last week, which I'll come back to, and spent two days working on the pantry. This is the one area of my house that has been halfway functional, and halfway a nightmare of epic proportions for a really long time. 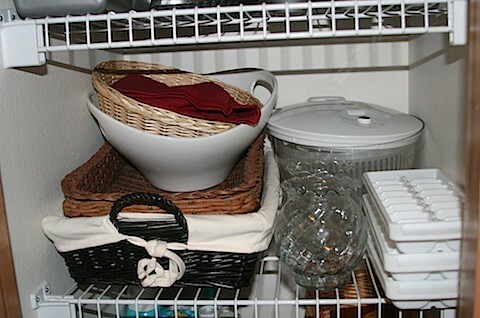 I was on the one hand very excited to tackle it, and also dragging my feet because I knew that organizing my "pantry" would also mean tackling three closets and a cupboard. For real. My stuff was so misplaced, with things that I need daily smashed in with tons of things I rarely use. Major overhaul required. Are you ready to see more pictures of my pantry and food than you ever could have possibly hoped for? I have two hall closets (but no closet in my entryway or office... go figure) and they mainly function as overflow from the kitchen. I don't have a before picture of the other closet, but rest assured, it was just as scary. Will you still be my friend after seeing this? 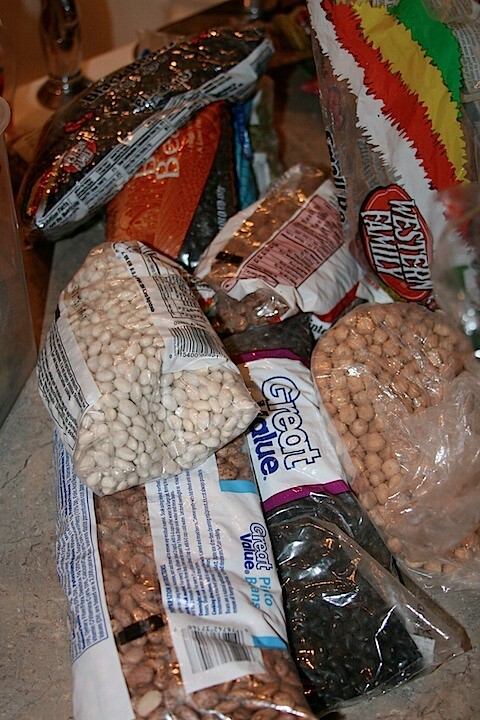 Won't somebody please organize this mess because I am starving! I'm sure there's food in here. MAMA! Don't worry, Baby B, I've got you covered. First step, remove everything and wipe down shelves. 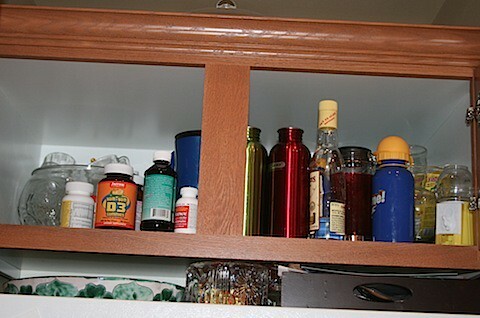 I moved all our adult beverages out of the main pantry. They don't belong in there because we never make cocktails. The last time I had a homemade fuzzy navel, just one mind you, I got the spins so bad I almost fell out of bed. Seriously. I may never drink again. With that top shelf cleared off, I had room for all our bulk paper goods, like espresso cups and paper plates. And a few straws I bought at Costco. 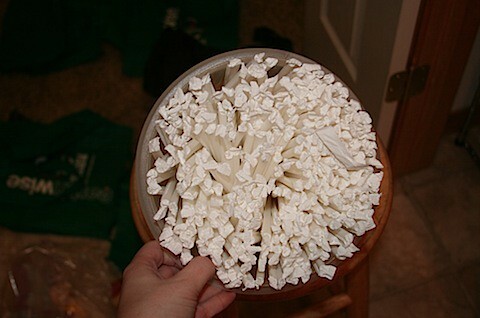 Because you never know when you might need 1500 straws. 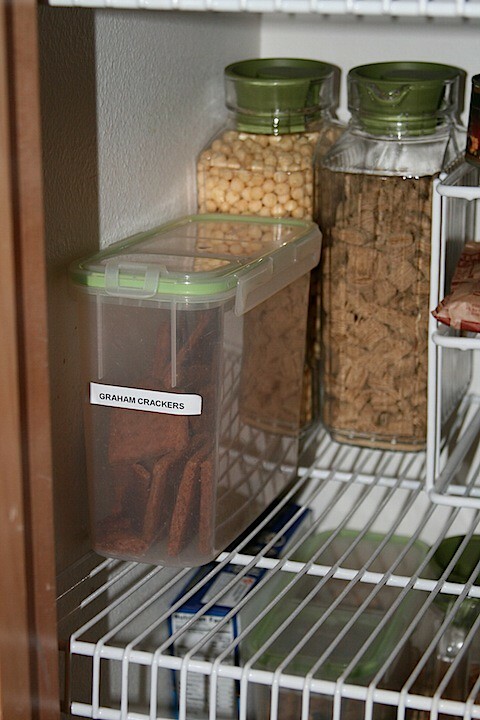 Did I mention that I bought a label maker specifically for this task? Well, I did. 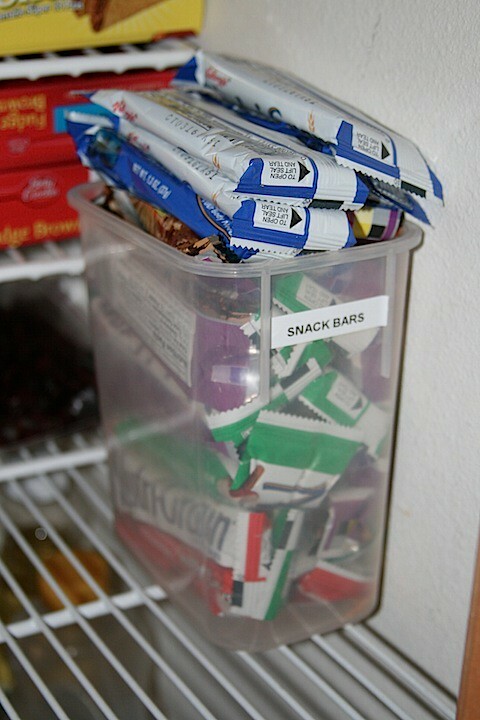 I'm not messing around with this organization thing, and all the Penelopies use label makers. 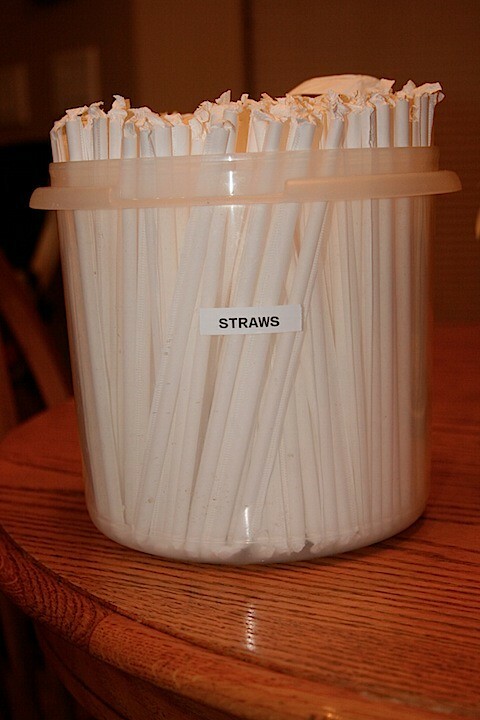 Without the label, there is no way I ever would have ever known what was in this bucket. 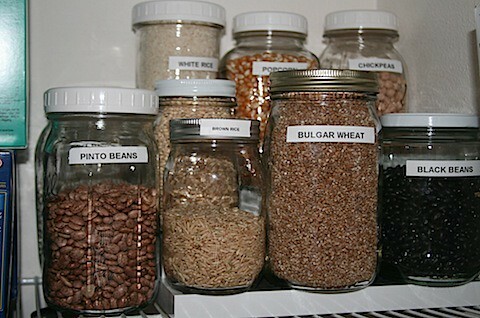 All these dry goods found new homes in mason jars; at least the ones that hadn't expired in 2007. I kind of think expiration dates on dry goods is a gimmick. My mom canned a bunch of beans for Y2K back in 1999 and she's still eating them. Does anybody know what I can use bulgar wheat for? Why did I buy that? I found this tiered thing in my office (in the Goodwill donation box) and decided to put it to work holding a few things. Now I will never again forget that we have pudding and brownie mix. Tru' dat. 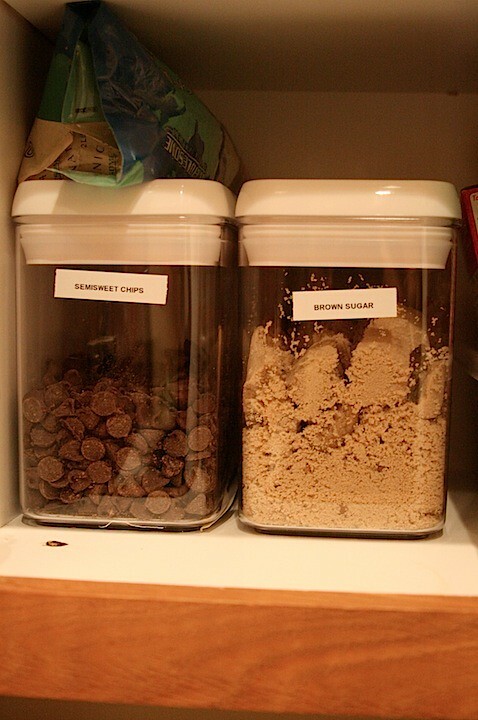 Graham crackers are labeled, and the cereal containers that I saved from the tupperware cupboard are filled and tucked safely away from toddler reach. My father-in-law bought all these granola bars and cereal bars for hunting and had a ton leftover so he gave them to us. The boys are in hog heaven because I never buy them. 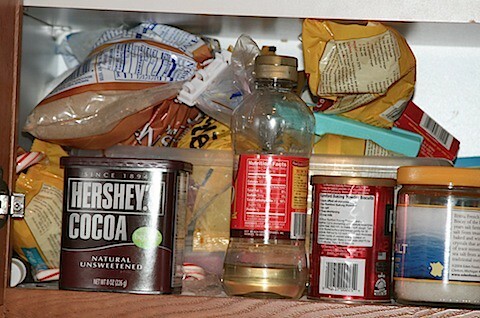 The bottom shelf is safely filled with boring stuff no right-minded toddler would want to touch. Except for the chips. How'd those get there? 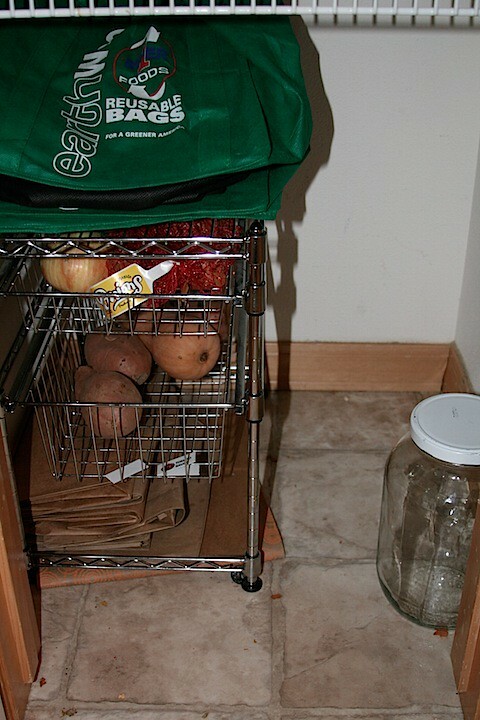 Bottom of the pantry has my metal thingy that holds potatoes and onions, paper bags and reusable shopping bags (awww, look at me reducing my carbon footprint) and a spot for my milk jar until I can give it back to the milk man. Yep, we have a milk man. I feel like I should be wearing a cute dress with a v-shaped collar and an apron while writing this post. Phew! Got that pantry done. And the natives were taking advantage of my distraction. I was beginning to think I may have bit off more than I could chew. 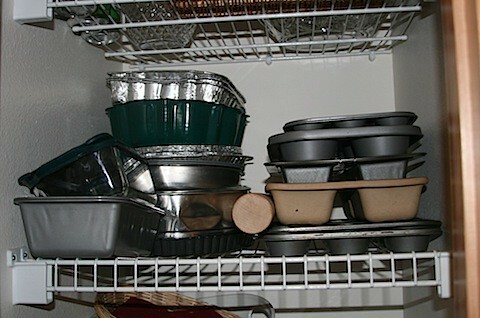 The closet in the hall that had no rhyme or reason soon had a shelf for baking pans. A shelf for misc stuff I don't use very often. 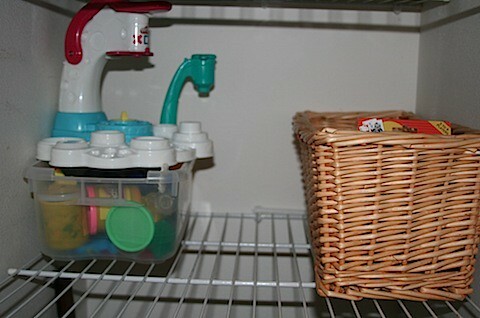 And a shelf at kid's eyelevel for playdough and card games (in the basket). The other hall closet no longer has any sort of decorating items stored in it. 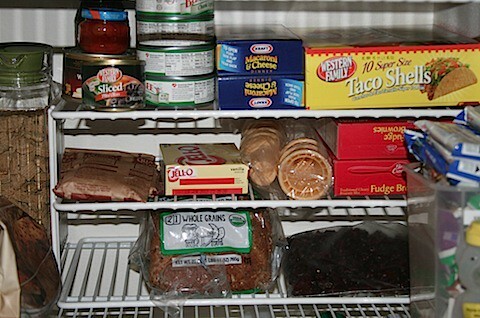 Strictly appliances, canned goods, and bulk items. It's not very photogenic, but I promise this closet is a looker in person. So with those three closets finished, I had two more areas to rearrange in order to complete the game of musical crap I was playing. The problem with having stuff in four different locations is that you cannot organize just one area because inevitably something has to be relocated. And the area above the fridge. The best way to describe that cupboard was "WASTE OF SPACE!" 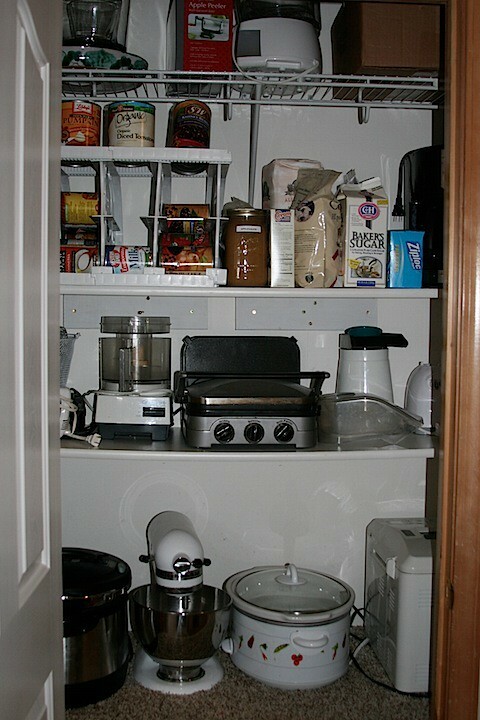 In the baking cupboard I moved as much stuff as possible into Gourmet Living canisters. These are my absolute favorite containers, but they are pricey so I only buy them when Shopko does a 50% off sale. Luckily, they were having one this weekend! I am always amazed at how much those canisters can hold. They have perfectly straight sides so they really squeeze together nicely on a shelf, and they are just wide enough to get a measuring cup into. 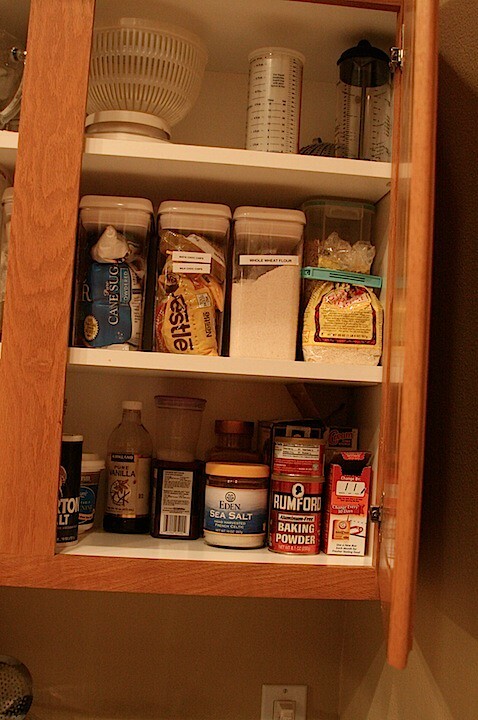 This cupboard is finally straightened out, and it makes me feel like baking. 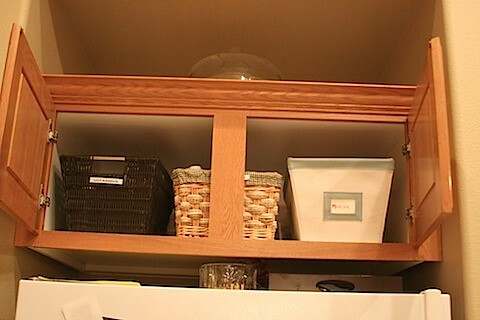 Lastly, the area above the fridge got a major purge, and three baskets were able to corral everything I wanted to keep. 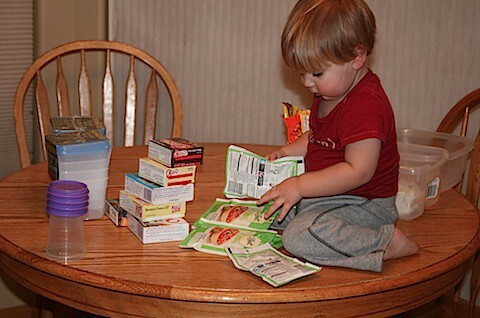 Vitamins, Medicine, and First Aid. 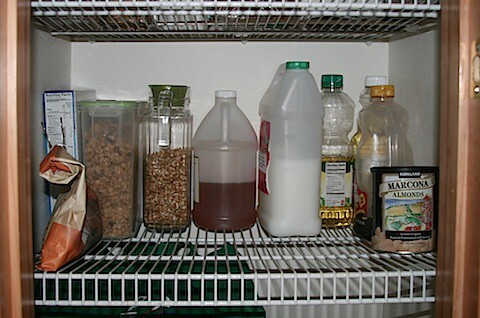 So that's it: The Great Pantry Makeover of 2011. I'm too tired to recap it one more time with befores and afters, and I don't even know if anyone is still reading. Suffice it to say, three closets and two cupboards are fully functional once more. Rhyme and reason have been restored. woo hoo! way to go, kira!!! 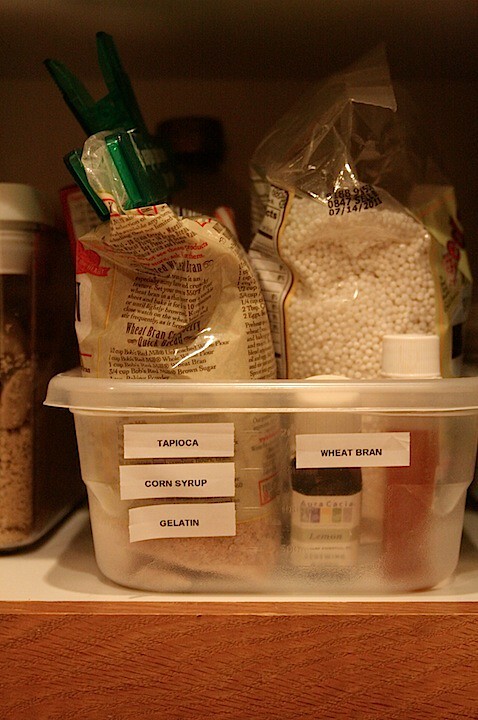 About the bulgur wheat: I have some hanging around too and have no idea what I bought it for. I've used it a couple of times but haven't found a good use for it yet (let me know if you find something spectacular). But, my mom told me I should keep it in the freezer if it was going to hang around for a while. I'm not sure if it's true, but I moved mine to the freezer since I can't even remember when I bought it! Man, I'm impressed with your tenacity. I'm just wondering...how does she do all that with so many little ones running around? Are you always that productive? 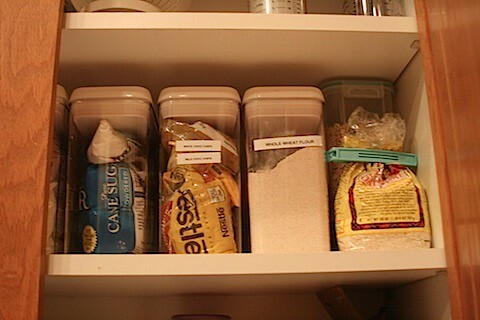 I can barely organize one shelf, much less a whole pantry! Way to go! WOW! You are my hero! 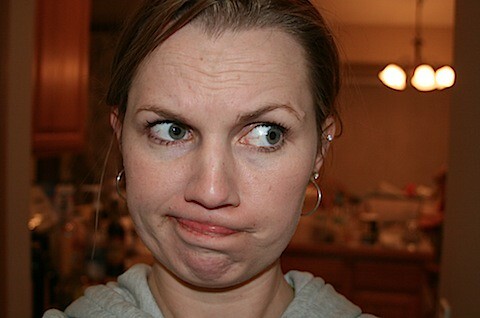 I'm seconding the person above...how do you do that while your kids are up? I thought I had to cram organizing in during naptime and it never seems to happen then. Amanda and Sam, do not be misled; I am rarely that productive. I really enjoy sitting on the couch with a book or my laptop. I can only do stuff like this in the dead of winter when my husband is off work (we own a plant nursery which is currently buried under snow). That's probably how all my closets got so out of control; ten months out of the year I'm a one-man circus act juggling all these kids and I do not have time for organizing. If I can just keep up on it I'm sure it won't take that long to maintain. 'If' being the operative word in that sentence. Wow! You are super woman. I know what you mean about how one project inevitably leads to another. Thanks for sharing. Kira, thanks for stopping by my blog, i love to get comments. 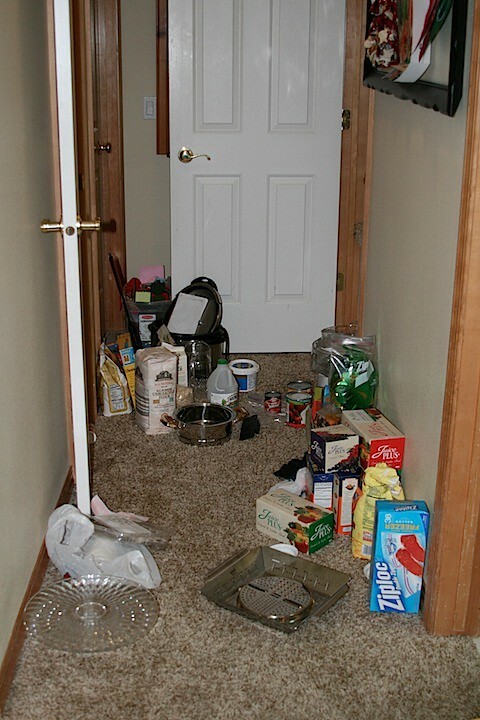 Just so you dont think I have it all together with these challenges my coat closet is pretty much still a hot mess because I cant figure out what to do with some of the stuff and I am not finished with the pantry either. Kira, I LOVE your writing style!! I'm still giggling. But I'm also super impressed with the organization ... and all while little ones are running free?! Amazing! Super Woman, for sure!